Seoul, South Korea -- Korea’s Buddhist temple cuisine is becoming more popular among healthy eaters within and outside Korea. 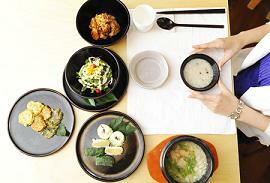 Reflecting the trend, the main theme of the largest Korean Buddhist order’s visit to New York last month was food. It organized a two-week promotional campaign to highlight and raise awareness about temple cuisine, one of the highlights of the templestay program which marks its 10th anniversary this year. The Cultural Corps of Korean Buddhism, an affiliate of the Jogye Order, has tried to modernize the recipes and make them more accessible to the public here and abroad. Temple food, referring to what monks and visitors eat at temples, is basically vegetarian and prepared with natural ingredients without artificial seasoning. At temples, eating is a part of the meditative discipline. Ven. Beopjin, director of Cultural Corps of Korean Buddhism, was in New York to oversee the activities. Small groups of 20 to 50, spanning from chefs, food specialists, and media to travel industry consultants, were invited to the Astor Center in Manhattan to taste various Korean temple food dishes for luncheon and dinner events over three days. Travel consultants received a detailed introduction to the templestay program, available at over 100 temples all over Korea. Food specialists had a chance to taste Korean soy sauce and fermented soy bean paste made using traditional methods in the temples. “In the future, we will publish recipe books and develop promotional material on temple food, while expanding opportunities for the general public to come to temples and make the cuisine themselves,” Ven. Beopjin said. Although Korean temple cuisine is vegetarian, in which meat, poultry and fish are forbidden, its practice is closer to vegan, as eggs are also not eaten and dairy is used sparingly. Five pungent vegetables - chives, leeks, garlic, onion and scallion - are prohibited for the reasons of causing hindrance in spiritual practice and to avoid an attachment to strongly flavored spices. This year marks the 10th anniversary of the templestay program, which made more people familiar with Korean Buddhism including non-believers and foreigners. The programs usually include monastic formal meals made up of healthy, vegetarian dishes; tea ceremonies; morning and evening chanting; and “Seon” or Zen meditation. The communal Buddhist meal or “balwoo gongyang” is a unique way of eating in Korean temples, where food is consumed in total silence and not a single grain of rice is wasted. Since it was first adopted 10 years ago, it has become one of the most popular tourist activities Korea. The Jogye Order has tried to make templestay programs more attractive to non-Korean participants. It has designated 15 temples that specialize in templestay specifically for foreigners, where they have professional interpreters.